Travelers on the I-25 near Aguilar, Colorado, see this hogback rising out of the plains east of town. This natural landmark can be seen for many miles in all directions. It's central spine (and only reason it exists as it is) is a vertical igneous intrusion, one of the many granite dikes that make up the radial dike system centered around the West Spanish Peak. 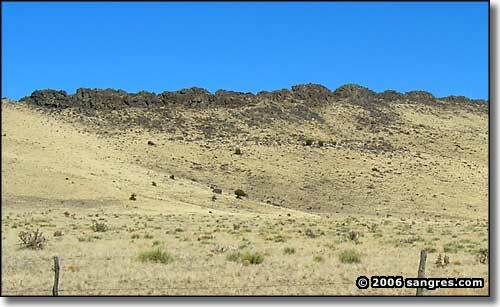 This appearance of the granite wall is around 30 miles east of the center of the system. And if you go around to the east side of this hill and look further east, you can see it still running cross-country at least 5 miles further out. These granite dikes formed when a magma intrusion flowed upward into vertical cracks in the ground radiating outward from the West Spanish Peak and then solidified. Over time, the surface materials eroded away and we're left with a landscaped containing many of these harder vertical formations, some of them protuding above-ground many miles from their original source. This area also includes a parallel igneous dike system that predates the forming of the Spanish Peaks and is oriented up with ridges running approximately 80° east of north.